Download "AT&T Online Fax User Guide Version 1.0"
1 AT&T Online Fax User Guide Version 1.0 Welcome to AT&T Website Solutions SM We are focused on providing you the very best web hosting service including all the tools necessary to establish and maintain a successful website. This document describes how to send and receive faxes in format, access your faxes from a mobile device or an client. With Internet access, Online Fax allows you to send faxes without using a fax machine or a second phone line from anywhere in North America AT&T Intellectual Property. All rights reserved. AT&T products and services are provided or offered by subsidiaries and affiliates of AT&T Inc. under the AT&T brand and not by AT&T Inc. AT&T, AT&T logo and all other AT&T marks contained herein are trademarks of AT&T Intellectual Property and/or AT&T affiliated companies. All other trademarks are the property of their owners. This document is not an offer, commitment, representation or warranty by AT&T and is subject to change. Your Web Hosting service is subject to the Terms and Conditions (T&Cs), which may be found at Conditions.aspx. Service terms and Fees are subject to change without notice. Please read the T&Cs for additional information. 3 1 Welcome to Online Fax Online Fax allows you to send and receive faxes in format, access your faxes from a mobile device or an client. With Internet access, Online Fax allows you to send faxes without using a fax machine or a second phone line from anywhere in North America. There are 2 interfaces that will be used for Online Fax: Panel Type Administration Panel Description Online Fax accounts are setup via theadministration Panel The administrator specifies the addresses that will be assigned a randomly selected fax number. The details of each Online Fax account are viewable in the Administration Panel. Online Fax The Online Fax interface allows the Online Fax users to manage their Online Fax account. Users are able to send/receive faxes, view queued/archived faxes. 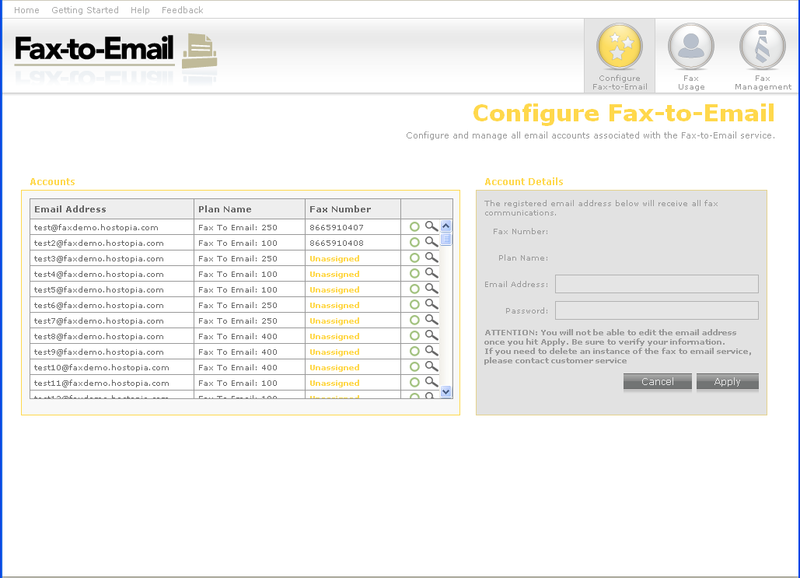 6 The Fax Usage button allows you to view the monthly usage breakdown, per user, total number of pages sent and received. Fax Management The Fax Management button allows you to manage (send and receive faxes) your fax account Secondary Menu The Secondary Menu is located in the top left corner of the Administration Panel of Online Fax and consists of the following links: Home, Getting Started, Help and Feedback. Secondary Menu Home Getting Started Help Feedback Description The Home link will open the Fax Usage section The Getting Started link will open the Getting Started with Online Fax page. You may enable/disable this page at any time. The Help link will guide you through configuring the fax to process. The Feedback link allows you to submit comments, suggestions or report a problem to the product development team. 7 2.2 Configuring the Fax to Wizard In your first session of Online Fax within the Administration Panel, the Configure Fax to section will require you to enter in Online Fax users. All sessions thereafter will provide you with a Configure Fax to wizard who will display lists of Online Fax users and their account information: Accounts, assigned fax number, type of Online Fax plan etc Configure Fax to TO CONFIGURE AN ADDRESS DO THE FOLLOWING: 1. In the Account details section enter in the following information: Address (This address will be assigned a randomly selected fax number; and will send/receive faxes.) Password (This password is assigned to the Online Fax account only. 2. Click Apply to complete the fax to process. Once an Online Fax account has been setup, modifications to the address and fax number will not be permitted. Please ensure that the account information is correct. To update an Online Fax plan, contact customer service or sales. 8 Once you have configured the Online Fax account the details will be listed in the Accounts section Selecting an Online Fax account Account details will remain inactive until an Online Fax account is selected. TO SELECT AN ONLINE FAX ACCOUNT, DO THE FOLLOWING: 1. Find the address you wish to view 2. Click the inspect icon. 3. The Account Details for the selected address should now be visible Modifying the Password TO CHANGE THE PASSWORD: 1. Enter in the new password in the Password field. 2. Click Apply to accept the changes. 3. A confirmation window will notify that changes have been accepted. 9 2.2.4 Deleting an Online Fax User You will have to contact our Sales or Customer Service to delete an account. The fax number and deleted Online Fax account will be placed on hold for 90 days before returning to our system. This number is not transferable. 10 2.3 Using the Fax Wizard Fax Usage displays the total pages in real time of sent and received faxes per user. When an account reaches its monthly limit of faxes allowed, the account owner will be charged a per-page overage fee for sent and received faxes. By default, the present month will display the current Pages Used/Available. To view previous months select the drop-down menu located in the Monthly Usage section. 12 3.1.1 Getting Started with Online Fax The Getting Started with Online Fax screen provides detailed options of Online Fax. When you first launch Online Fax - Fax Management, the Getting Started with Online Fax screen is loaded as your initial menu. The Main Menu bar remains static throughout all of the Online Fax - Fax Management and you will be able to navigate to whichever section you wish by clicking on the menu options Navigating the Main Menu When you log in to Online Fax, the main menu is listed with details regarding each option. Once you select an option, the main menu moves to the top-right corner of the page. The following options are available: Inbox, Send Fax, Outbox, Archive, Contacts. Please see the table below for more details regarding each menu option. Main Menu Description Inbox The Inbox page allows you to manage received faxes. Each fax is stored in the Inbox for 30 days, during which time, you can view, download as a PDF or TIFF, move to an archive, or delete. Send Fax The Send Fax page opens a screen that allows you to create and send faxes online. Outbox The Outbox page allows you to view the queue of all outbound faxes. 13 Archive The Archive page displays faxes that have been archived on our system. These faxes are held for a period of thirty days. Contacts The Contacts page allows you to create, manage and store fax and contacts. 14 3.1.3 Navigating the Secondary Menu The Secondary Menu is located in the top left corner of the Administration Panel of Online Fax and consists of the following links: Home, Getting Started, Help and Feedback. Secondary Menu Description Home The Home link directs you to your Inbox Getting Started The Getting Started link directs you to the Getting Started with Online Fax screen. Help The Help link will guide you through managing fax to . Settings The Settings link allows you to update your account information: company details, your personal signature. Logout The Logout link will log you out of the current session of Online Fax. 3.2 Managing your Online fax Settings The Settings page allows you to update your account information: company details and your personal signature as well as your preferences in terms of your cover letter template and attachment format Contact Details In this section you can edit your contact details that will appear on your cover letter of your fax. The fields that you can edit are: Your name, Company, Location and Phone number. 1. Enter your data in the text fields provided. 2. Click Apply to save changes. 3. Click Cancel to dismiss the changes made. Note: Entering your name is mandatory. Also please note that you will not be able to edit your address and fax number. 15 3.2.2 Cover Page In this section you can chose a cover page template. 1. Click on to zoom in on a chosen template. 2. Click on the chosen template. As soon as you click on a template it will be displayed with a check mark. 3. Click Apply Preferences In this section you can choose the format of the fax attachment, as well as the language in which you would like to use the application. 16 1. Select the preferred language from the drop-down. 2. Choose the attachment format you wish by clicking on the radio button. (PDF or TIFF). 3. To have the deleted faxes, which have exceeded their storage period sent to your , check the me a copy of all automatically deleted faxes that have exceeded their storage period check box. 4. To use a cover page when sending faxes from your account, check the Use a cover page for faxes sent from my account check box. 5. Click Apply to save the changes made. 6. Click Cancel to dismiss the changes Password In this section you can change your current password. 1. Enter your current password in the Current password field. 2. Enter a new password in the New Password field 3. Enter your new password again into the Confirm password field. 4. Click Apply to save the changes made 5. Click Cancel to dismiss the changes made. Note: Your password must be between 5-10 characters. 17 3.2.5 Additional Accounts In this section you can add up to 5 additional accounts. TO ADD A NEW ACCOUNT: 1. Click Click to add an additional account. The "Additional accounts details" box on the right will become active. 2. Enter an address in the box provided. Note: address is mandatory. 3. Check off one or both of the functionality that you want to add to your address: "Receive faxes in my account" or "Send faxes from my account". Note: You must choose at least one of the options. 4. Click Add. 5. Click Cancel to dismiss all the changes made. TO VIEW AN EXISTING ACCOUNT: 1. Click on to view the details of the account. 2. The "Additional accounts details" section on the right will become active and it will display the details of the chosen account. TO DELETE AN ACCOUNT: 1. Click on to delete an account. A pop-up will ask you to confirm the deletion of the chosen account. Click Yes to confirm the deletion. Click No to cancel the deletion. 18 3.2.6 Blocked Numbers In this section you may block fax number(s). TO SEARCH FOR A BLOCKED FAX NUMBER: 1. Enter a fax number in the Fax number field. Note: The proper fax number format includes only numbers and dashes. The area code must be included. 2. Click Search. The results will be displayed within the same page. Note: This search will only display blocked fax numbers. TO BLOCK A FAX NUMBER: 1. Enter a fax number in the Fax number field. Please note that the proper fax number format includes only numbers and dashes. The area code must be included. 2. Click Block in order to block the fax number entered. TO DELETE A BLOCKED FAX NUMBER: 3. Enter a fax number in the Fax number field. Please note that the proper fax number format includes only numbers and dashes. The area code must be included. 4. Click Search. The results will be displayed within the same page. Note: This search will only display blocked fax numbers. 5. Click on the icon besides each number in order to delete the number. 6. Click Yes to confirm the deletion or click No to cancel the deletion. 20 TO PREVIEW THE FAX: Click the View Fax icon. TO VIEW A FAX: Click the View Fax icon. The fax thumbnail is displayed. TO ROTATE THE FAX: Click the Rotate Fax icon. The fax image will rotate 90 clockwise. TO A FAX AS AN ATTACHMENT: 1. Click the fax document icon. The Forward fax via screen opens. 2. Enter the address in the Recipients field. Note: Multiple entries must be separated by commas. Alternatively, click the Select contact(s) link to add a contact from the list of existing contacts 3. Enter the message description in the message field. 4. Click Send. 21 TO DOWNLOAD FAX AS A PDF: 1. Click the Download PDF icon. All the fax contents will be converted into a PDF document in a detached window. 2. Click the Save icon. TO DOWNLOAD FAX AS A TIFF: Click the Download PDF icon. All the fax contents will be converted into a TIFF document. TO MOVE A FAX TO THE ARCHIVE: 1. Click the Move to Archive icon. 2. On the Confirmation dialog, click Yes. TO DELETE A FAX: 1. Click the Delete icon. 2. On the Confirmation dialog, click Yes. Note: Faxes that have been deleted are permanently removed from the system and cannot be restored. 22 3.4 Sending Faxes The Send Fax section allows you to create and send files on your computer as faxes; you can also send faxes to multiple recipients simultaneously. Once sent, a fax will be queued in the Outbox for delivery. When sending a fax, you have the option to include a cover page, include recipients from your contact list, and add multiple attachments. TO SEND A FAX: 1. Enter the fax number in the Destination Fax numbers text box. Alternatively,enter multiple fax numbers by: Manually enter multiple numbers. Note: Separate multiple fax numbers with a semi-colon. Click Add from contacts to select numbers from your saved contacts. 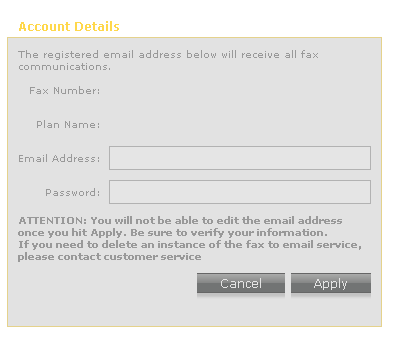 Note: A dialog opens, where you can select the fax numbers that you want to add. 2. Too attach files to your fax, click Browse in the File(s) to Fax. You may attach up to three files..
23 3. To add a cover page, select the Yes radio button and complete the following: Select the cover page Language from the drop-down. Enter the following information: " Person" - (to whom will you address this fax) Enter the Company Information - (company name) - (location) (phone number, - (subject line - Regarding), and - (comments). If you wish to change the cover page template click the Change cover page link. A new window will open where you will be able to choose a new template. 4. Click Send. Your fax will be placed in the Outbox with status message indicating success /failure of delivery. An attached file cannot exceed 5 MB in size. 3.5 Monitoring the Outbox The Outbox contains messages that have been queued for sending. A maximum of twenty faxes are queued at any given time (each phone number in a fax with multiple recipients is counted as a separate fax in the queue). The speed at which the queue clears will depend on the complexity of the images being faxed and the length (number of pages) of each fax. Online Fax will make 5 attempts to send your fax to each recipient. Once a fax has been successfully sent, the fax will be automatically moved from Outbox to your Archive folder; you will also receive a notification by that the fax was sent successfully. ) located in the right- When a fax is queued in the Outbox it can be removed using the "Delete" icon ( hand column. 24 3.6 Archiving Sent and Received Faxes The Online Fax Archive provides storage capability for both sent and received fax transmissions. All faxes that have been successfully sent are automatically moved into Archive. However, if you wish to store received faxes, you must select the Move to Archive option from the Inbox. For more details on how to move items from the Inbox, see the To Move a Fax to the Archive: section. The Archive page is separated into two sections: the Archive Search section provides a search provides search parameters, which allows you to narrow or broaden your search criteria as needed. The Archive Results section displays a list of fax transmissions and is based on the search criteria entered. Please note that the default list is All Items. Within the Archive Results section, you can use the same Fax Management Tools that are available in the Inbox. For more information regarding the fax management options, please see the Management Options section. TO SEARCH FOR A FAX: 1. Enter any of the following search criteria: Keywords within a fax Company name Select whether you want to search faxes that were Sent, received or both Start Date and End Date select the date. 2. Click Search. Faxes are permanently removed from Archive after 40 days. 25 3.7 Managing Contacts The Contacts section of Online Fax allows you to maintain a contact list of fax numbers. This section is separated into two pages: the Fax Contacts page displays a list of contacts along with their details. The Contact Import page provides can be added to your list manually or imported via.csv (comma separated value) file. Fax contacts may be used when sending or replying to a fax Fax Contacts The Fax Contacts page contains two sub-sections: the Contact list and the Contact details. The Contact list displays a list of all contacts added to Online Fax. The Contact details section allows you to edit the information associated with a contact. TO ADD A CONTACT TO YOUR LIST: 1. Click the Fax Contacts link. 2. In Contact list section, click on Add a contact. 3. In the Contact Details section, enter the required information. 4. Click Add. 26 TO DELETE A CONTACT TO YOUR LIST: 1. In Contact list section, click on the contact for which you want to delete. 2. Click the Delete icon. 3. In the Confirmation dialog, click Yes Contact Import The Contact Import page allows you to upload multiple contacts into your list via.csv file. When uploading contacts, it is important to note that the.csv file must have the required fields populated. Please make sure your list adheres to the following format: "Company One Name", Fax Number, "Contact Person", "Location", "Phone number", "Description", " Address" CSV (Comma Separated Value) file must follow a specific format in order to be successfully imported; click the "View a sample CSV file" link located above the "File Name" field. TO IMPORT A CONTACT LIST: 1. Click the Contact Import link. 2. In File name filed, click Browse. 3. Choose to ignore or overwrite duplicate contacts. 4. Click Import. 3.8 Usage of Online Fax account Your Online Fax account has a monthly limit. This limit varies by the specific package type you have chosen. Once an account has exceeded its monthly page quota, the user will be charged on a per-page basis. Quota warnings are ed to the user at 80%, 90%, and 100% to Fax The to fax feature allows you to send a fax from any of your existing Online Fax account numbers. You do not need to log in to the Online Fax application to use this feature. Note: If you have multiple fax numbers associated with your account, you must specify which number you are sending the fax from. 27 Send Fax from 1. From your account, create new In the To field, enter one of the following: If you only have one fax number associated with your account, enter the fax number to followed Example: If you have more than one number associated with your account, enter the fax number to + fax number from followed Example: Note: Do not use spaces or hyphens in the in the subject line. Any unnecessary characters will prevent successful fax transmissions. We are focused on providing you the very best service including all the tools necessary to establish and maintain a successful website. July 2012 Domain Manager User Guide Welcome to AT&T Website Solutions SM We are focused on providing you the very best service including all the tools necessary to establish and maintain a successful website. RockendSMS Enhanced Integration SMS for REST Professional RockendSMS has newly designed and developed an upgrade to the way you send SMS through REST Professional V14 and above (RockendSMS Enhanced Integration). Nokia Internet Modem User Guide 9216562 Issue 1 EN 2009 Nokia. All rights reserved. Nokia, Nokia Connecting People and Nokia Original Accessories logo are trademarks or registered trademarks of Nokia Corporation. User Manual. Version 1.0.0.0. Yeastar Technology Co., Ltd.
Mitel and NuPoint Messenger are trademarks of Mitel Networks Corporation.